Do you fancy yourself an artist? If you want to use your iPad as part of your artistic talents, ArtStudio — Draw and Paint is the program to use to paint your masterpieces. Even if you have limited artistic talent, you can see that this app has everything you need to create awesome artwork. Here are the options for just one of ArtStudio’s tools (there are dozens and dozens more). 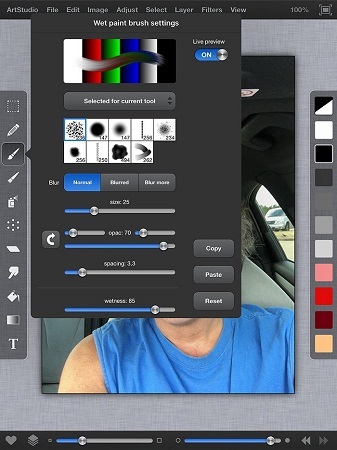 ArtStudio for iPad’s Wet Paint Brush Settings and brush options. Offers 25 brushes, including pencils, a smudge tool, bucket fill, and an airbrush. Brushes are resizable and simulate brush pressure. Allows up to five layers with options, such as delete, reorder, duplicate, merge, and transparency. Provides filters, such as blur, sharpen, detect edges, and sepia. Don’t believe this humble opinion? AppSmile.com rated it 5 out of 5, saying, “This is what Photoshop Mobile wishes it had been.” SlapApp.com also rated it 5 out of 5 and said, “I’ve dabbled in quite a few painting and drawing apps and this one has ’em all beat by a long shot.” And by all means, check out what talented artists can do with ArtStudio. If you’re not ready to invest $4.99, check out ArtStudio — Draw and Paint LITE, a free version that offers a taste of the real deal but with smaller canvases, limited layer and export support, and fewer custom brushes. Beware of rip-offs in the iTunes App Store, such as the similarly named Art Studio HD — For Your iPad. That one’s a bad knock-off from developer Party Sub Productions that has garnered mostly 1-star ratings. Don’t be fooled; the app you’re looking for is ArtStudio — Draw and Paint from Lucky Clan. Note that Art and Studio are run together to form a single word; if you search for the single word ArtStudio, you’ll find it.